Syllabus of the Online Course (Subject): Central Asia Regional Economic Cooperation (CAREC) Programme. In 2001 ten Central Asian countries (Afghanistan, Azerbaijan, China, Kazakhstan, Kyrgyz Republic, Mongolia, Pakistan, Tajikistan, Turkmenistan, and Uzbekistan) with the support of six multilateral bodies (Asian Development Bank) creates the Central Asia Regional Economic Cooperation (CAREC) Programme. 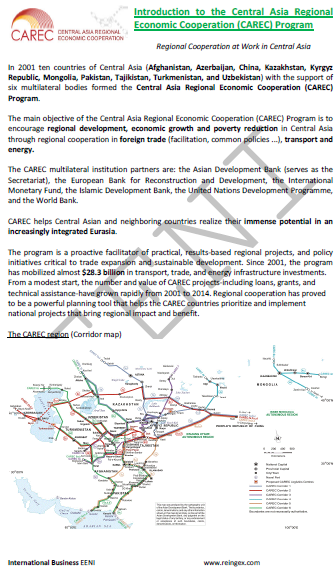 The main objective of the Central Asia Regional Economic Cooperation (CAREC) Programme is to encourage regional development, economic growth, and poverty reduction in Central Asia through foreign trade cooperation (trade facilitation, common policies), transport, and energy. In order to boost regional trade, improve trade facilitation, develop transport corridors and energy sector, the Central Asia Regional Economic Cooperation (CAREC) Programme has launched the CAREC 2020 Strategic Framework. 156 projects are developed under the CAREC with 24 billion dollars of investments in energy, foreign trade, and transport. 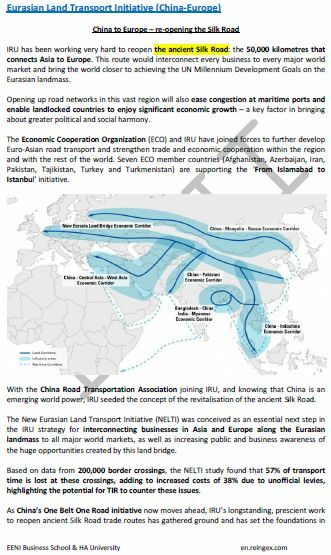 The economic corridors development in the region is a priority for the Central Asia Regional Economic Cooperation (CAREC) Programme: multimodal transport, logistics, and economic zones.